ARTIST: A. Hudyakov, Ukraine. - HOLDER: V. Lopata (Ukrainian artist). 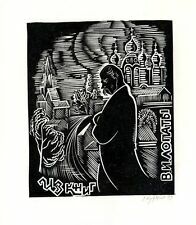 - ARTWORK: Original Exlibris Bookplate. - PLATE SIZE: 11.0 x 9.5cm. - PAPER SIZE: 19.0 x 13.5 cm. ARTIST: MR. BRAINWASH. HOW ACQUIRED:ACQUIRED AT THE "UNDER CONSTRUCTION /ART BASIL" ART SHOW IN 2011. YEAR OF ORIGIN: 2011, ONLY A HANDFUL OF THESE WERE MADE TO PROMOTE THE "UNDER CONSTRUCTION" ART SHOW. Mr Brainwash George Washington Print Show Card banksy shepard fairey MBW. Shipped with USPS First Class Package. 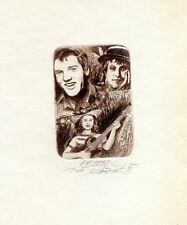 ARTWORK: Original Ex libris Bookplate Etching - ARTIST: Juri Polacek - SIGNED: signed in pencil - TECHNIQUE: etching - PLATE SIZE: 6.0 x 4.0 cm. - PAPER SIZE: 14.5 x 10.0 cm. - CONDITION: excellent See scan. MR. BRAINWASH. REVERSE SIDE FEATURES QUOTES FROM BANKSY AND SHEPARD FAIREY OF OBEY GIANT. PROMOTIONAL SHOW CARD OFFSET LITHOGRAPH. POP ART, GRAFFITI ART, POPULAR CULTURE. ACQUIRED AT THE "LIFE IS BEAUTIFUL" ART SHOW IN 2008. MR. BRAINWASH. REVERSE SIDE FEATURES QUOTES FROM BANKSY AND SHEPARD FAIREY OF OBEY GIANT. A MUST HAVE FOR ALL MR. BRAINWASH FANS! GEORGE WASHINGTON. POP ART, GRAFFITI ART, POPULAR CULTURE. UP FOR SALE IS A RARE 4 X 6 2-SIDED PROMOTIONAL PRINT BY. MR. BRAINWASH. REVERSE SIDE FEATURES QUOTES FROM BANKSY AND SHEPARD FAIREY OF OBEY GIANT. A MUST HAVE FOR ALL MR. BRAINWASH FANS & LEONARDO DA VINCI FANS! "MONA LISA LINES" -BAR CODE. POP ART, GRAFFITI ART, POPULAR CULTURE. MR. BRAINWASH MONA LINES PRINT2008 BANKSY OBEY QUOTES. MR. BRAINWASH. ACQUIRED AT THE "UNDER CONSTRUCTION /ART BASIL" ART SHOW IN 2011. PROMOTIONAL SHOW CARD PROMO OFFSET LITHOGRAPH. "MAX SPRAY" GREY EDITION. EXTRA NOTES: 100% OFFICIAL & AUTHENTIC BANKSY ARTWORK! ARTIST: BANKSY. HOW ACQUIRED: ACQUIRED AT THE "BANKSY VS BRISTOL MUSEUM" ART SHOW IN 2009, BRISTOL, ENGLAND. ARTIST: MR BRAINWASH. EXTRA NOTES: A MUST HAVE FOR ALL MR. BRAINWASH FANS AND BANKSY FANS! ART SHOW:"ART SHOW 2011". MR. BRAINWASH GEORGE PRINT 2008 BANKSY OBEY QUOTES. ARTIST:MR. BRAINWASH. EXTRA NOTES: A MUST HAVE FOR ALL MR. BRAINWASH FANS! NOTES: REVERSE SIDE FEATURES QUOTES FROM BANKSY AND SHEPARD FAIREY OF OBEY GIANT. From 2008 first art show Life is Beautiful Miami. Very rare not many given out. Very hard to find. MR BRAINWASH. GEORGE WASHINGTON RAYBAN. A MUST HAVE FOR ALL MR. BRAINWASH FANS! POP ART, GRAFFITI ART, POPULAR CULTURE. ACQUIRED AT THE "I HEART LA" ART SHOW 2011. "ART SHOW 2011". NO, BUT VERY RARE ART PROMOTION. MR. BRAINWASH. ACQUIRED AT THE "UNDER CONSTRUCTION /ART BASIL" ART SHOW IN 2011. KATE MOSS COVER GIRL. POP ART, GRAFFITI ART, POPULAR CULTURE. ONLY A HANDFUL OF THESE WERE MADE TO PROMOTE THE "UNDER CONSTRUCTION" ART SHOW. MR. BRAINWASH DAVID BOWIE PRINT2008 BANKSY OBEY QUOTE. MR. BRAINWASH. "DAVID BOWIE" - ZIGGY STARDUST. REVERSE SIDE FEATURES QUOTES FROM BANKSY AND SHEPARD FAIREY OF OBEY GIANT. A MUST HAVE FOR ALL MR. BRAINWASH FANS! "BANKSY CRUDE OILS". WITH THE OFFICIAL ARTWORK TITLE & "BANKSY 05" ON BACK. ACQUIRED AT THE "BANKSY CRUDE OILS" ART SHOW IN 2005. THE "BANKSY CRUDE OILS" ART SHOW. 100% AUTHENTIC BANKSY ARTWORK! 100% OFFICIAL & AUTHENTIC BANKSY ARTWORK! MR. BRAINWASH. AS SEEN IN BANKSY'S OSCAR NOMINATED. KATE MOSS" COVER GIRL. PROMOTIONAL SHOW CARD PROMO OFFSET LITHOGRAPH. WHY SPEND THOUSANDS ON THE PRINT. DON'T MISS THIS OPPORTUNITY TO GET THIS BEFORE IT'S GONE AT THIS SUPER LOW PRICE. ARTIST: MR. BRAINWASH. EXTRA NOTES: A MUST HAVE FOR ALL MR. BRAINWASH FANS! NOTES: REVERSE SIDE FEATURES QUOTES FROM BANKSY AND SHEPARD FAIREY OF OBEY GIANT. MR. BRAINWASH. CAMPBELLS WARHOL SPRAY. POP ART, GRAFFITI ART, POPULAR CULTURE. 2011, ONLY A HANDFUL OF THESE WERE MADE TO PROMOTE. ART SHOW IN 2011 IN MIAMI. THE "UNDER CONSTRUCTION" ART SHOW. NO, BUT VERY RARE ART PROMOTION. MR. BRAINWASH MONA LINES PRINT2008 BANKSY OBEY QUOTES. MR. BRAINWASH. A MUST HAVE FOR ALL MR. BRAINWASH FANS AND BANKSY FANS! AL L B E ST OF F E R S AR E W EL C O M E! D O N 'T MISS THIS OPPORTUNITY TO GET THIS BEFORE IT'S G ONE A T THIS SUPER LOW PRICE. MR. BRAINWASH. REVERSE SIDE FEATURES QUOTES FROM BANKSY AND SHEPARD FAIREY OF OBEY GIANT. "ALFRED HITCHCOCK". PROMOTIONAL SHOW CARD PRINT OFFSET LITHOGRAPH. POP ART, GRAFFITI ART, POPULAR CULTURE. ACQUIRED AT THE "LIFE IS BEAUTIFUL" ART SHOW IN 2008. SEALED CLOSE NEVER OPENED, INSIDE ORIGINAL ENVELOPE. MR. BRAINWASH MONA LINES PRINT2008 BANKSY OBEY QUOTES. MR. BRAINWASH. A MUST HAVE FOR ALL MR. BRAINWASH FANS AND BANKSY FANS! KATE MOSS MULTIPLES. POP ART, GRAFFITI ART, POPULAR CULTURE. ACQUIRED AT THE "UNDER CONSTRUCTION /ART BASIL" ART SHOW IN 2011. MR. BRAINWASH. Charlie Chaplin Heart. POP ART, GRAFFITI ART, POPULAR CULTURE. EXTRA NOTES NO, printed signature. ART CLASSIFICATION ONLY A HANDFUL OF THESE WERE MADE TO PROMOTE THE ART SHOW. YEAR OF ORIGIN. MR. BRAINWASH DALAI LAMA PRINT2008 BANKSY OBEY QUOTES. ARTIST: MR. BRAINWASH. EXTRA NOTES: A MUST HAVE FOR ALL MR. BRAINWASH FANS! MR. BRAINWASH MONA LINES PRINT2008 BANKSY OBEY QUOTES. ARTIST: MR. BRAINWASH. EXTRA NOTES: A MUST HAVE FOR ALL MR. BRAINWASH FANS! MR. BRAINWASH. "BAT PAPI". HOW ACQUIRED:ACQUIRED AT THE "UNDER CONSTRUCTION /ART BASIL" ART SHOW IN 2011. ART CLASSIFICATION: POP ART, GRAFFITI ART, POPULAR CULTURE. MR. BRAINWASH. "MICKEY MOUSE & MINNIE DC". POP ART, GRAFFITI ART, POPULAR CULTURE. ACQUIRED AT THE "I HEART L.A. ART SHOW / LOS ANGELES" ART SHOW IN 2011. "I HEART L.A. ART SHOW". ONLY A HANDFUL OF THESE WERE MADE TO PROMOTE THE "I HEART L.A." ART SHOW. From 2011 Miami Art Basel. Very rare not many given out. MR. BRAINWASH. REVERSE SIDE FEATURES QUOTES FROM BANKSY AND SHEPARD FAIREY OF OBEY GIANT. A MUST HAVE FOR ALL MR. BRAINWASH FANS! Dodgers Fans. POP ART, GRAFFITI ART, POPULAR CULTURE. ACQUIRED AT THE "LIFE IS BEAUTIFUL" ART SHOW IN 2008. DOLK LUNDGREN. A MUST HAVE FOR ALL DOLK FANS. CHE GUEVARA. ARTIST'S CONDITION, ART SHOW CONDITION. POP ART, GRAFFITI ART, POPULAR CULTURE. ART CLASSIFICATION THE REVOLUTION, THESE PICTURES WILL BE FIRST AGAINST THE WALL" ART SHOW. MR. BRAINWASH. AS SEEN IN BANKSY'S OSCAR NOMINATED. PROMOTIONAL SHOW CARD PROMO OFFSET LITHOGRAPH. POP ART, GRAFFITI ART, POPULAR CULTURE. TO PROMOTE THE ART SHOW. ART SHOW IN 2008. NO, BUTVERY RARE ART PROMOTION. "BANKSY VS. BRISTOL MUSEUM". ACQUIRED AT THE "BANKSY VS BRISTOL MUSEUM". ONLY A HANDFUL OF THESE WERE MADE TO PROMOTE THE "BANKSY VS BRISTOL MUSEUM" ART SHOW. 100% AUTHENTIC BANKSY ARTWORK! 100% OFFICIAL & AUTHENTIC BANKSY ARTWORK! MR. BRAINWASH PUNK PRINT 2008 BANKSY OBEY QUOTES. MR. BRAINWASH. REVERSE SIDE FEATURES QUOTES FROM BANKSY AND SHEPARD FAIREY OF OBEY GIANT. DON'T MISS THIS OPPORTUNITY TO GET THIS BEFORE IT'S GONE AT THIS SUPER LOW PRICE. ARTIST: MR. BRAINWASH. ART CLASSIFICATION: POP ART, GRAFFITI ART, POPULAR CULTURE. HOW ACQUIRED: ACQUIRED AT THE "UNDER CONSTRUCTION /ART BASIL" ART SHOW IN 2011. MR. BRAINWASH. A MUST HAVE FOR ALL MR. BRAINWASH FANS AND BANKSY FANS! MONA LISA CARS. POP ART, GRAFFITI ART, POPULAR CULTURE. ACQUIRED AT THE "UNDER CONSTRUCTION /ART BASIL" ART SHOW IN 2011. ONLY A HANDFUL OF THESE WERE MADE TO PROMOTE THE "UNDER CONSTRUCTION" ART SHOW. ARTIST: MR. BRAINWASH. EXTRA NOTES: A MUST HAVE FOR ALL MR. BRAINWASH FANS! HOW ACQUIRED:ACQUIRED AT THE "LIFE IS BEAUTIFUL" ART SHOW IN 2008. 100% OFFICIAL & AUTHENTIC BANKSY. "BANKSY CRUDE OILS". WITH THE OFFICIAL ARTWORK TITLE & "BANKSY 05" ON BACK. AS SEEN IN BANKSY'S OSCAR NOMINATED. ACQUIRED AT THE "BANKSY CRUDE OILS" ART SHOW IN 2005. MR. BRAINWASH. BATMAN & ROBIN. PROMOTIONAL SHOW CARD PROMO OFFSET LITHOGRAPH. POP ART, GRAFFITI ART, POPULAR CULTURE. ART SHOW IN 2011. TO PROMOTE THE "I HEART L.A." ART SHOW. NO, BUTVERY RARE ART PROMOTION. MR. BRAINWASH. PABLO PICASSO HEART. PROMOTIONAL SHOW CARD PROMO OFFSET LITHOGRAPH. POP ART, GRAFFITI ART, POPULAR CULTURE. ACQUIRED AT THE "MIAMI ART BASEL ART SHOW". "ART BASEL". THE ART SHOW. WHY SPEND THOUSANDS ON THE PRINT. MR. BRAINWASH MONA LINES PRINT2008 BANKSY OBEY QUOTES. ARTIST: MR. BRAINWASH. EXTRA NOTES: A MUST HAVE FOR ALL MR. BRAINWASH FANS AND BANKSY FANS! "BANKSY CRUDE OILS". WITH THE OFFICIAL ARTWORK TITLE & "BANKSY 05" ON BACK. ACQUIRED AT THE "BANKSY CRUDE OILS" ART SHOW IN 2005. PROMOTE THE "BANKSY CRUDE OILS" ART SHOW. 100% AUTHENTIC BANKSY ARTWORK! MR. BRAINWASH MONA LINES PRINT2008 BANKSY OBEY QUOTES. MR. BRAINWASH. "PABLO PICASSO HEART". PROMOTIONAL SHOW CARD PROMO OFFSET LITHOGRAPH. POP ART, GRAFFITI ART, POPULAR CULTURE. ART BASIL" ART SHOW IN 2011. Mr. Brainwash Bat Papi Postcard Print Showcard Banksy Pop Art Card 2008 Rare NEW. Shipped with USPS First Class Package. Back of print marked E.L. Major, but I have researched this print, and found information that says year 1902 by E. L. Mayer, not sure if this is a printing error. MR. BRAINWASH. 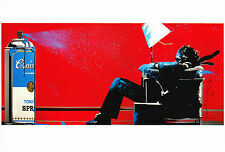 A MUST HAVE FOR ALL MR. BRAINWASH FANS AND BANKSY FANS! BATMAN & ROBIN. POP ART, GRAFFITI ART, POPULAR CULTURE. ACQUIRED AT THE "UNDER CONSTRUCTION /ART BASIL" ART SHOW IN 2011. ONLY A HANDFUL OF THESE WERE MADE TO PROMOTE THE "UNDER CONSTRUCTION" ART SHOW.